I love this comfortable and cute outfit, I wore it out on the weekend and was able to snap some quick photos of it too. Yay! The Collectif Dolores top is now a wardrobe favourite and I would love to have it in other colours now as they will go well with most things I own! The cherry capris are so fun and great for a cute casual look when I don't want to wear a dress/skirt... Of course I had to wear my clip-on cherry earrings with this outfit. This weekend I hope to wear some of my two-piece playsuits out as it is meant to be very hot, which is mainly just a good excuse for going to the beach and wearing pretty summer clothes that have been yearning to be worn all winter. Lovely and your hair is amazing! So so pretty, love the hair and the lips. 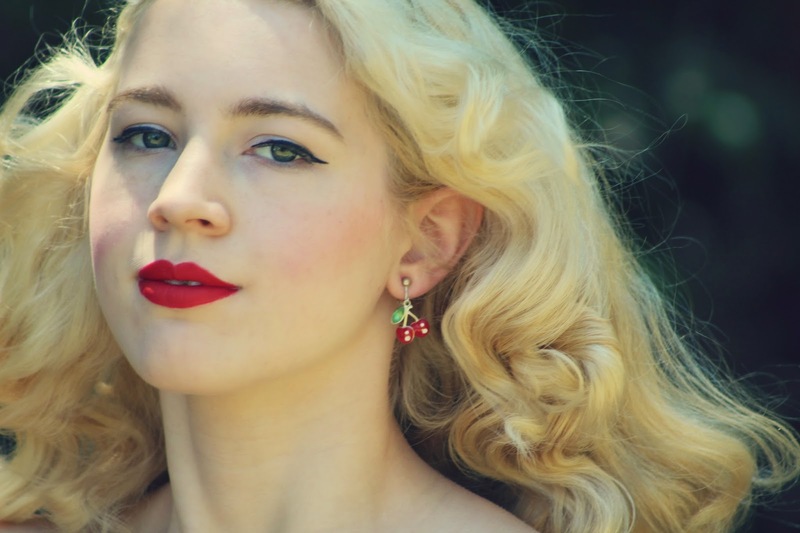 Love Collectif clothing and also cherries...yay! !